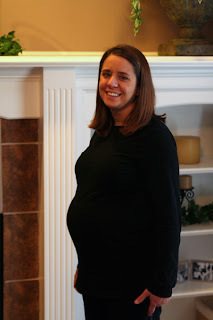 For the first post to the blog, here's a picture of Andrea at 30 weeks. So far her pregnancy has gone pretty well except for one scare where she was feeling bad and she went into the hospital. They pretty much told her to take it easy and she's been working less and has been doing well since then. As of this posting, there's only 3 1/2 weeks to go until the due date! We're getting excited to meet the new baby! How sweet! The nursery looks perfect. I remember when I looked (and felt) like Andrea does now. I would stand by the crib and think, "The beds right here and the baby's right here. Why can't I just put it in there now!" Good luck with all the hard work ahead. It will be over before you know it and the baby will be sleeping there.